Parshuram Jayanti information | Parshuram Jayanti celebration details. Parshuram the sixth incarnation of Vishnu is the epitome of valour and devotion towards parents. Once his father, Jamadagni got angry with his wife Renuka and ordered Parshuram to murder her. Parshuram obeyed him and killed his mother. Contented with his act Jamadagni asked his son to ask for anything whatever he wanted. Parshuram asked to bring back his mother to life. It was Parshuram’s cleverness that brought back his mother to life again. In this way Parshuram proved his devotion to his father and mother. Jamadagni and their Kama Dhenu cow were killed by a kshatriya king, Kartavirya Sahashrarjun. Thus Parshuram vowed to kill all the kshatriyas on this earth and made it free from the autocracy of the kshatriyas. All the kshatriyas fled away due to the terror of him and no one remained to protect this earth. So Kashyap muni ordered Parshuram to leave this world. 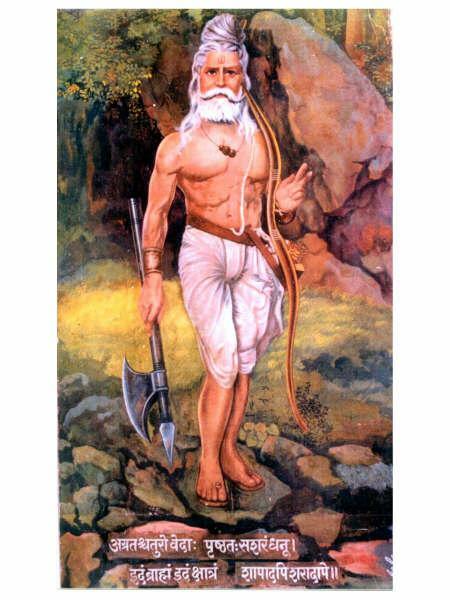 Parshuram went to mountain Mahendra and began living there. The birthday of Parshuram is celebrated on the 3rd day of Shukla Paksh of Vaishakh month. Fast is kept on this day to be blessed with son and is also called Parshu Rama Dwadashi. According to Varah Puran by keeping a fast on this day the devotee enjoys his stay in Brahmiok and will be reborn to become a great king. Akshaya Tritiya is another name for the birthday of Lord Parasuram. There is a strong belief the merits gained by good acts on this day is permanent. It is believed that Akshaya Tritiya marks the beginning of the Treta Yug. "This is one of the most auspicious days according to the Hindu calendar. The day on which Moon, Sun and Jupiter unitedly come under Mrigshira Nakshatra is called Akshay Tritiya." “Akshay Tritiya”,the holy day when many perform puja to start a business. According to the Hindu customs, many choose to perform the pujas for Business,bathe in holy rivers, make a charity, offer barley in a sacred fire, and worship Lord Ganesha & Devi Lakshmi on the holy day of “Akshay Tritiya”. It is considered a good time to invest in gold and diamonds. It is believed that whatever is bought on this day, will remain forever.